The Palms Casino Resort, also known simply as the Palms, is a casino hotel and residential tower located in Paradise, Nevada. The main tower has 702 rooms and suites and contains a 95,000 sq ft (8,800 m2) casino, a recording studio and a 2,200 seat showroom. The resort has become a popular destination for many, especially with younger people and Hollywood actors. The Palms was Britney Spears's base for her first wedding debacle and is still the retreat of choice for tabloid staples. The Palms has perhaps some of the most comfortable beds in Vegas, thanks to fluffy pillows and duvets that make one reluctant to rise, plus big TVs and huge bathrooms.The pool areas got party-spot makeovers, turning what were kind of bland "stand and pose" watering holes into the kind of trendy must-visit beach areas this kind of crowd loves. Barbie has moved some of her favorite things from her Malibu pad (home of Barbie’s 50th Birthday Bash) to The Palms Las Vegas so girls of all ages can experience the fantasy and fun of Barbie’s lifestyle. 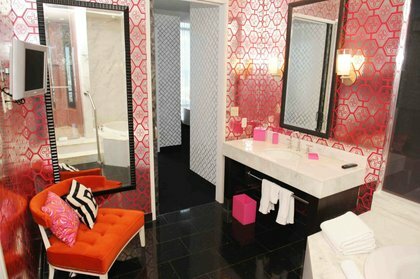 Designed by famed "Happy Chic" interior designer Jonathan Adler, this suite is the ultimate bachelorette pad! 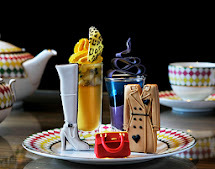 Featuring custom details that celebrate Barbie's pink panache, such as skirted, corseted, lace-up “dress” chairs, a sunburst mirror made from 65 Barbie dolls and custom wall coverings in Barbie’s signature patterns. 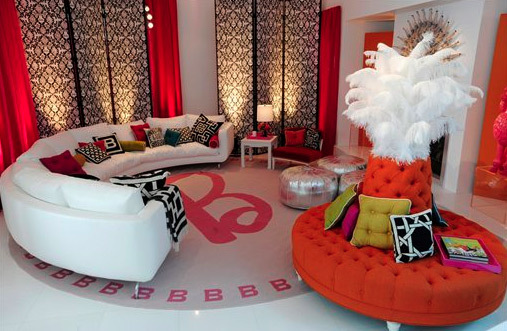 This suite lets guests live it up in true Barbie style! In addition to the custom Hot Pink suite décor, guests can also enjoy relaxing in an extra-large Jacuzzi tub, get cozy in front of a two-way fire place and take in amazing views of the Las Vegas strip. It can accommodate for 2 - 4 guest.